This year's Speedy Expo was the largest we've ever held as Liverpool Exhibition Centre hosted over 1,500 delegates and around 130 of Speedy's key suppliers. There were a host of games, competitions and awards to enter over the 2 day event and one lucky entrant was Terry Bide from Speedy Teesside. 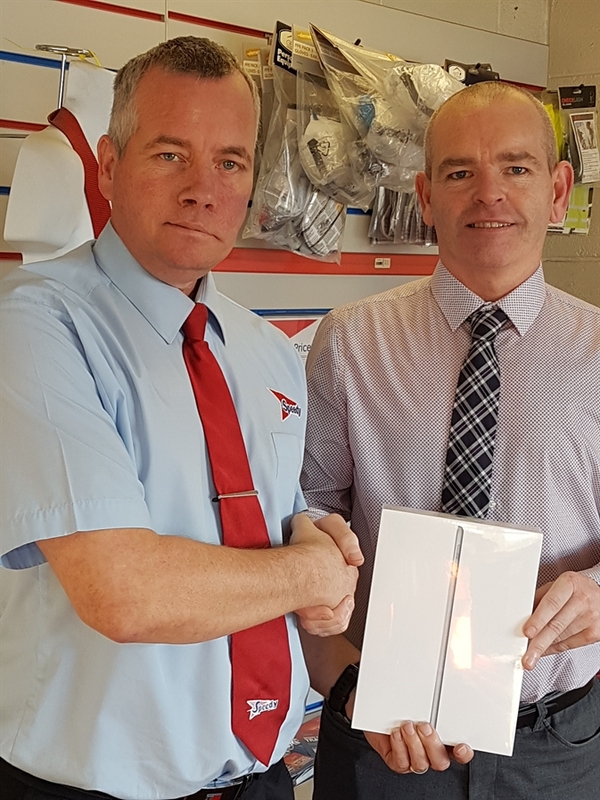 Terry visited the Lloyds British/Speedy stand to guess at the combined years of lifting experience now held in the business with Speedy and Lloyds engineers, by getting the closest answer for the combined years Terry won the latest 5th generation iPad. Pictured a few weeks ago, Speedy Lead engineer Paul Walsh presented Terry with his prize on 18th January. Make sure you keep an eye out for details of the next Speedy Expo in 2018!